This mountain home offers tons of common living area with a huge loft, living room with rock fireplace, and basement family room. Windows galore for amazing mountain views and sunlight along with large wrap around deck for entertaining. New carpet in living room and dining room. This home is located just 9 miles (15 minutes off I-70), and 30 minutes to west Denver and the closest ski area. Enjoy all that St. Mary's Glacier has to offer: the glacier hike and ski; 2 private stocked fishing lakes; and more off road trails than you can count for atving, hiking, and cross country skiing. You will love this small community and all it's beauty! 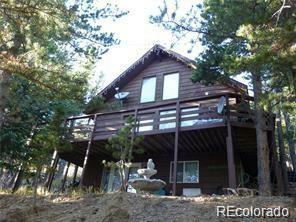 Offered by Alpine Mountain Properties.